I love music. I mean, I really love music. Discovering new tunes and artists is one of my favorite things to do, particularly when I’m at work and desperate for something good to listen to. Lately I’ve been discovering more and more artists and bands that do video game themed songs, which I absolutely love. I’ve known about a few for a while, but just today I discovered someone I’d never heard of before. 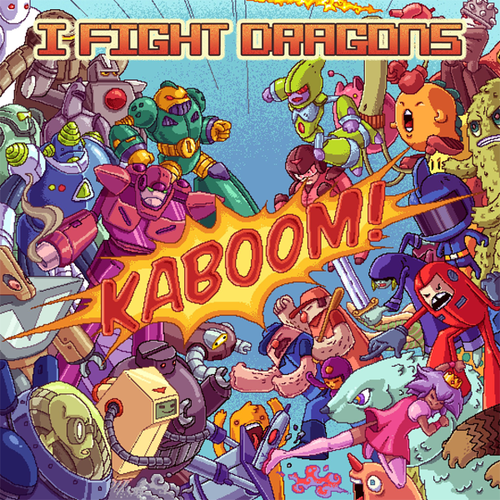 I Fight Dragons have been around for a few years, and this particular album was released in 2011. Kaboom! had my attention by the first track, and I was pleasantly surprised by both the technical and lyrical prowess on display in their songs. It’s an upbeat, energetic, and fun sound, and I was really enjoying it from the start. However, it wasn’t until around the middle of the album (a romantic ballad called “With You”) that I also realized just how much heart this album had to it. Unlike the more irreverent crudeness of Starbomb (who I still love), this album has an honesty and a reality to it that’s pretty hard to find in gamer-centric music. I think that’s because I Fight Dragons don’t choose to only sing about games themselves. Here you’ll find songs about love, loss, joy, insecurity, and discontent – songs about the real world. Instead of yet another snide song to the tune of Mario Bros, we get an entire album about looking at reality through the lens of the gamer. “Disaster Hearts” was another standout to me, and doesn’t even have any explicitly game-related material, besides some cleverly inserted lyrics about “restarting” and “bits”. As the title might imply, it’s a song about recovering from devastating loss and real world pain on your own terms, and in your own time. I’m also not afraid to say that I may have teared up while listening to it. Actually, it wasn’t until the end of the album that I realized not one song had even mentioned any specific games. “The Geeks Will Inherit the Earth” is about as close to a gamer anthem as we’re ever going to get, and “Fight For You” is an amazingly heartfelt song about standing beside the one you love. That was one of my favorites, because unlike a lot of other gamer songs, it’s is also very relationship-positive (“Save the girl and the world will be jealous – Wouldn’t you if you knew that the truth was the girl would save you too?”). All in all, I’m so happy that I stumbled across this album. These guys haven’t gotten anywhere near the exposure they deserve, but hopefully that’ll change soon. They’ve just recently released another album called The Near Future that I haven’t listened to yet, but I’ll let you guys know how it is once I do! Do yourself a favor and go listen to this album. You’re welcome. Previous Post Aydian Dowling for Ultimate Guy! Next Post Get Over Here! !